Trinity Band Ring, Heavy version. 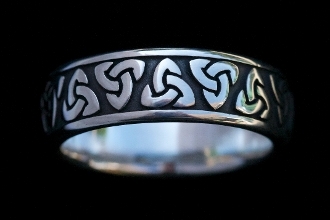 Our Products >> KNOTWORK BAND RINGS >> Trinity Band Ring, Heavy version. Heavy Men's Trinity band ring. This is the heaviest mens ring I make that is in a normal width ring. The interior is convex treated for comfort. I have recently added extra large sizes in this ring from 8 to 17! There is an up charge for the size 13 through 17 (see ordering page). I also make a matching woman's narrow version of this ring. The symbolism of this most classic of all Celtic knots is named for the Holy Trinity: Father, Son and Holy spirit. I also must add that there are a LOT of ideas and images in sets of 3 in ancient Celtic society, as well as in the post Christian realm of art and symbolism. Life, Death and Rebirth was a classic cold world belief that made the Celts quite fearless in battle. Earth, Sea and Sky were honored as the 3 primal elements in the Bardic tradition (Fire was separate, see Bridgid Goddess imagery). Even the Claddagh ring was based on a family value concept much older than the ring of Friendship, Loyalty and Love. Many God's and Goddesses, animals and other concepts were set to the backdrop of 3 aspects.